I’ve seen a few reviews for the Apple Watch so thought I’d post my thoughts around Apple’s new device now I’ve had it for a few weeks. I purchased the Apple Sport with blue band, the 42mm version & was one of the lucky ones to get the device on day one (24th April). First thing to note is how well I feel the Apple Watch Battery performs. I’d heard all sorts of rumours that the battery was the issue & cause of the delay, however it’s been very good, very good indeed. In fact it’s been outperforming my iPhone. The biggest drawback to the Apple Watch is that the battery life on my iPhone 6 (which wasn’t great in the first place) has become terrible. Pre Apple Watch I could get through an entire day without it being drained by the evening or even early afternoon. This i feel is the biggest problem with the Apple Watch, I’m hoping through next generations that both the iPhone & Apple Watch improve battery life dramatically. At present I need a charger with me at all times should the watch zap the battery life from my iPhone. 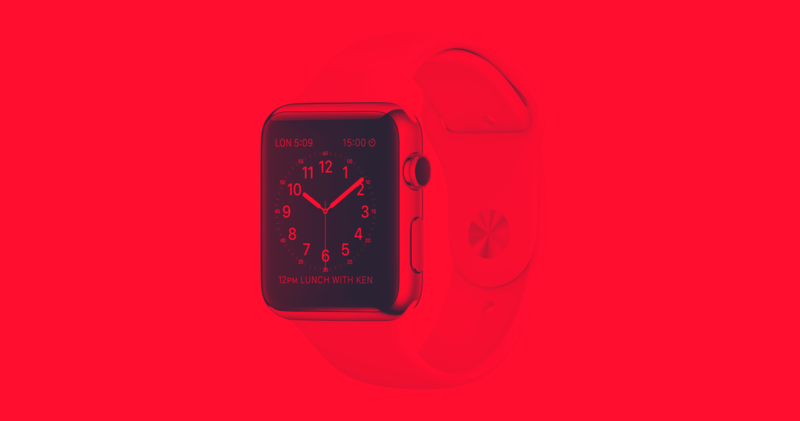 The Apple Watch depicted in Apple’s marketing pieces actually looks quite large. However I was really surprised when I tried it on. It was actually relatively small. Even the larger 42mm version. I had thought initially I had bought the 38mm but realised how small that version is! In future generation this will become smaller & speaker but I actually really like the size of the watch at present. It’s pretty much spot on. Although initially I was impressed with the Apple Watch faces I have found a few niggles with these so I’m hoping Apple review these or make them even more customisable. For instance My favourite watch face is ’Utility’, i strip back all the numbers. And add indicators, which are useful to me. For example the Activity, Weather, Calendar & Battery. However… that’s 4 items & utility will only display 3 items with the bottom item taking the whole width at the bottom. I did switch to the watch face ’Simple’ as that does support 4 icons in each corner, however the dial is different & I cannot add the Date with the Week Day which you can do on Utility. This seems strange to me. I can customise certain things on certain watch faces but not on others. Ideally I’d like to make the watch truly personal I’m hoping for improvements or more variations in the next release of the Apple Watch software. I also use these icons as shortcuts. So for example clicking to the Activity app via the Icon. So why can’t I click through to the Calendar from the date on the watch face? Or even switch to the battery glance when I click on the battery? To make sure that I got the watch in good time I opted for the Apple Sport with blue band. I’d heard everyone oping for the steel version, or black sport version. So I opted for the least likely to sell quickly. I knew I could always change the strap. In fact I’m still waiting for a black band to be despatched. The blue wasn’t my first choice. But I don’t mind it. It is extremely comfortable but can get a bit sweaty & cause slight irritation. Nothing bad, I’ve had this before with other watches but it is very light and feels very comfortable. My biggest question was ‘Can i wear this on my right wrist?’ The watch looks to be made for the left handed watch wearer & was disappointed when the design only came suited for that set up. So initially I set mine up for my left wrist and wore it for about 40 minutes before realising i wouldn’t get on with it that set up that way. So I readjusted the watch to work on my right wrist. I wasn’t happy about the digital crown being at the bottom as I’d always seen the watch suited for left wrists with the crown at the top. It felt like poor design to me. I was hoping apple would have created 2 versions. However after wearing for a few minutes I realised that didn’t matter. It actually made sense to have at the bottom. It actually felt better to use & it actually looks the correct way to wear it now. For me, anyhow. To be honest, the apps haven’t blown me away & there is a long wait occasionally for some apps to load such as the weather & news apps like Yahoo digest, Flipboard & the BBC News app. I also find them pointless to read on the watch. Especially when it directs the user to handoff to their phone. There is a long way to go regarding apps & I don’t necessarily think these types of apps work ever well on such a small screen. It does however excel in the notification department. This is what I will be using the watch for. Determining if the notification needs my attention or if I can ignore with a simple glance. Instead of pulling my phone out of my jeans every few minutes. It actually does work well & do like the subtle ‘haptic’ nudge i get from the device. It’s almost as someone has flicked my wrist. Then I can make the choice if t is urgent to respond on my iPhone. Having said that the messages app using Siri works really well, and making calls via the Apple Watch (as if I’m talking to KITT) is really cool and works much better than I thought it would. But in real life I feel a bit conscious about using it that way at the moment. So that I’ll do privately until it becomes the norm. I’ve noticed multiple little quirks with the Apple Watch, nothing to worry about but occasionally it can be slow to transition, which are sometimes played twice. I’ve seen the scrollbar appear on the watch face a couple of times whilst not in editing mode, very strange. The watch turns on when you raise your wrist. Which works remarkably well. That’s if you’re not layed down. Whilst laying on my bed watching TV it can be really frustrating to get the watch turned on & see the time or notification. There is always the fail safe of touching the watch to illuminate the screen however I just want it to work whilst raising my wrist. Whether that is being stood up or layed on the sofa. To conclude, I really like the Apple Watch. It is very comfortable, seems quite durable & does exactly what I need or would want a watch to do (and a whole lot more that I don’t necessarily want it to do). There’s still plenty to fix & make it truly personal, especially with watch faces in mind. The screen is really sharp & very responsive. In the next generation I’d expect them to reduce the size even more (even though it feels right at the moment) but my number one feature would be to stop hammering my phones battery. When that is sorted I’d consider this to be a must buy. At present it still has that 1st generation feel about it. It’s almost there & I really like it but suspect I’ll feel very envious when Apple Watch 2 appears.